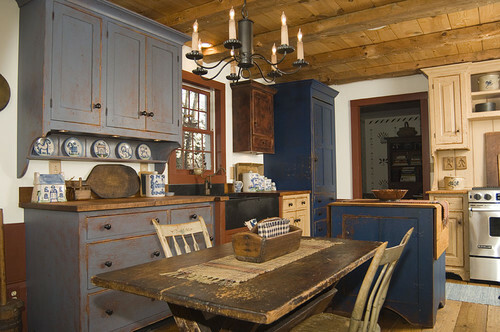 So lately I have been thinking about reworking my country kitchen. Again. I know, I already did that. But the foundation is sinking again, and all of the cherry cabinets that I didn't even like in the first place are separating. Now, I could fix the house and try to wedge the cabinets back together. But since it’s making me a little madder every day, I’m just about over the whole thing, and looking for remodeling ideas. There is no more sigh of happiness when I walk in that room. What I feel is a little closer to despair with some ennui blended in for good measure. It bums me out. Big time. The problem, of course, is funds. I'll fix the house, because that has to be done. But I'm not loving the idea of keeping everything else as it is. 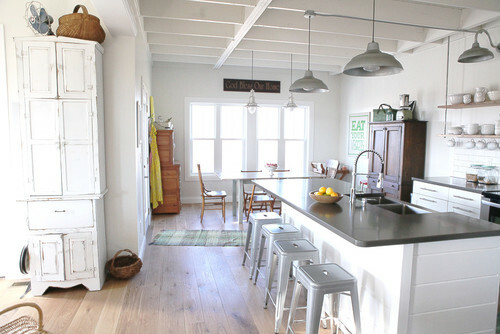 I am so in love with this kitchen that I don’t even know where to begin. Now, money and I have never been great friends. That might be the reason why the mishmash, eclectic style that I am most comfortable with evolved. I have different names for it on different days, but it’s a bohemian, shabby, gypsy, witchy, bohemian farm house sort of thing. Some people love it, others hate it. Meh. It’s my house. And because I change things in my house the way I change my nail polish, I rarely have commitment issues. If I hate it, out it goes. Eventually. Some of you can decide that you want a new kitchen, and you’ll just head on out to the Home Depot and make it happen. My life has never really been like that. I have learned patience over the years. It’s the joy of the ride, not just the destination. I save my pennies. I shop sales. I scour thrift stores. I buy things on lay-away, paying small bits at a time toward whatever it is that I need. I habitually visit the Habitat for Humanity ReStores, both in Knoxville and Oak Ridge. Knox Rail Salvage and I are old friends. I try never to buy anything full price or on credit if I can help it. These things have served me well. I’m increasingly interested in freestanding cupboards instead of built-ins. 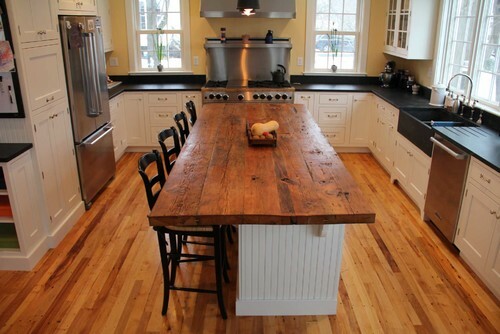 So on my bohemian, eclectic, country kitchen, I’m trying to come up with some remodeling ideas. I can build cabinets. That’s not a problem, and I know how to do it on the cheap. And when I say cheap, I mean that each new cabinet would cost me no more than about $10, $15 tops if I by new hardware, which I probably won’t. I’m a major fan of reusing what I can. I could build all that I want and need for no more than about $100. I didn’t leave out any zeroes there. I already have a garage full of lumber. Full, I say. Seriously enamored with deep red and open shelves these days. The beadboard ceiling is nice, too. I’m trying to tap my inner inspiration fairy. I am positive that the black granite countertops are outta here. I might reuse it elsewhere, or I might sell it. I haven’t made up my mind on that just yet. Mr. V. loves it, but I don’t think it fits with this house. So when I have some spare time, which is increasingly rare but also increasingly divine, I think about my sad little kitchen. Well, sad big kitchen. It's huge. Blue isn't half bad, either. 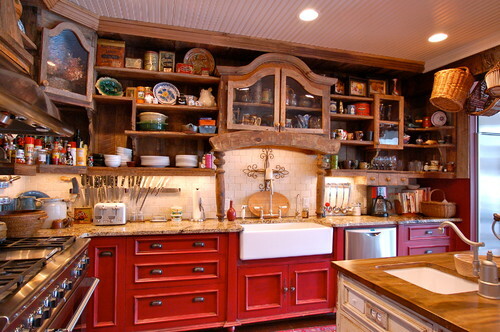 And again with the mismatched cupboards, which I love. What will it look like? How will it function? I have no idea just yet. I wish I was still in contact with my former landlady. 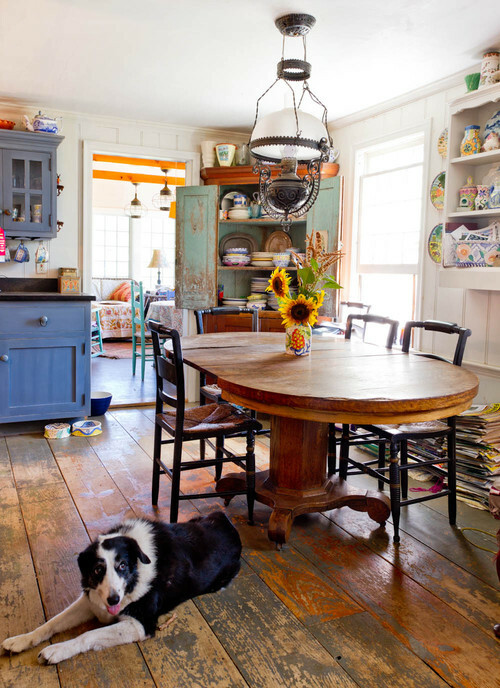 She really knew how to take a bad kitchen and transform it into something that not only looked great, but functioned so well that it was a pure joy to be there. I wish I had even half her talent. She wasn't as enamored with the eclectic country kitchen look as I am, but she'd probably indulge me. 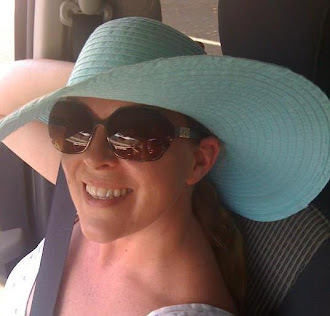 Until I’m ready to dive in, I’ll peruse Pinterest and Houzz. At least there I can get lost in dreams about my new kitchen, if only for a little while until I have a work deadline to meet. If you have any ideas on what I should do with my kitchen, please don’t keep them to yourself! Did I mention that I'm in need of inspiration?